During the winter of 2005, some 175 citizens and close to twenty experts participated in a wideranging dialogue aimed at generating ideas in support of a healthy Québec. These deliberations, organized by the Institut du Nouveau Monde (INM), brought to light the desire among citizens for the creation of a Bureau d'audiences publiques en santé (BAPS). Modelled on the Bureau d’audiences publiques sur l’environnement (BAPE – office of public hearings on the environment) created in 1978 in Québec, this new agency would provide citizens with a forum dedicated to assessing the potential health effects of any large scale project to be developed in the province. The citizens demanded: “That the government carry out a systematic prior assessment of the health impact of public policies and that it modify these policies to reduce their harmful effects” (Venne & Famhy, 2005, p.83) [Translation]. Although these proposals did not produce the changes they recommended, they aptly illustrate two things: First, there is growing recognition that the policies of various government sectors can affect population health. Whether public policies originate from the area of lotteries or from the transportation, environment, revenue, education, daycare, or social housing sectors, they can have consequences for health and its determinants. It is thus desirable to assess their potential impacts before they are implemented. Secondly, these two events also demonstrate that both citizens and health professionals would like citizens to be able to participate in such assessments. Health Impact Assessment (HIA) can be defined as a combination of procedures, methods and tools by which a policy, program or project may be judged as to its potential effects on the health of a population (European Centre for Health Policy, 1999). The application of Health Impact Assessment (HIA) is a practice that has generated much interest since its emergence in the 1990s. HIA can be defined as “a combination of procedures, methods and tools by which a policy, program or project may be judged as to its potential effects on the health of a population” (European Centre for Health Policy, 1999). The goal of HIA is to estimate, with the help of scientific and contextual information, the potential impacts of policies on population health so as to minimize the negative and maximize the positive effects. The founding documents of HIA, and in particular the Gothenburg consensus paper (European Centre for Health Policy, 1999), identify citizen participation as one of the cornerstones of HIA. In fact, some practitioners and researchers maintain that an HIA remains incomplete without the effective and concrete participation of the community (Dannenberg, Bhatia et al., 2006, p.266). However, there seems to exist a significant gap between rhetoric and practice. In fact, not only are participatory practices in HIA still limited in scope and number (Gagnon, St-Pierre et al., 2010), but also the very idea of citizen participation in HIA seems poorly articulated and is sometimes called into question (Mahoney, Potter et al., 2007; Wright, Parry et al., 2005). 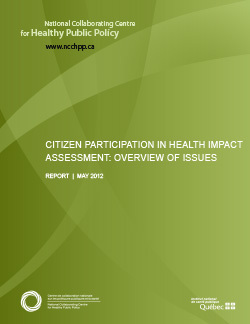 surrounding citizen participation in HIA. Citizen participation refers to all of the means that are used to involve, whether actively or passively, citizens or their representatives in an HIA process. Basing our discussion on a review of the literature on HIA carried out using predetermined terms, we will first examine the principal arguments in favour of citizen participation. We will then put these arguments into perspective, by also addressing some of the obstacles and risks associated with citizen participation in HIA.